The Destiny: The Taken King exotic armor is even better than the exotic weapons. Warlock’s get brand new exotic pieces for every slot, including their first pair of exotic boots. As we continue to explore Destiny’s 2.0.0 update, we get to anticipate the new looks our guardians will be sporting. As always you can CLICK HERE to look at Bungie’s armory in detail and check out all of the new exotic pieces. Warlock gear looks like it will have a great impact on running strikes, raids, and crucible matches. 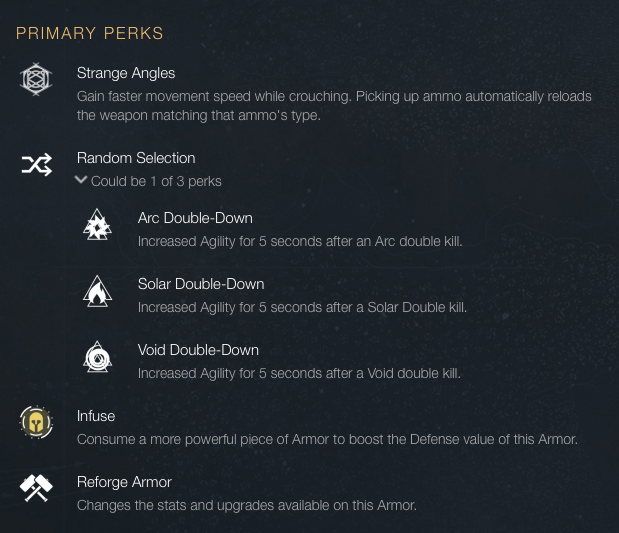 The perks even look like they will be more customizable than ever. Read below to find out more about the Warlock’s Transversive Steps. Finally the Warlocks will be getting a pair of exotic boots! But that is not the only piece of exotic that they can choose from in Destiny: The Taken King. Feel free to check out our previous posts on Hereafter a new exotic sniper rifle and Dark-Drinker a new exotic sword. 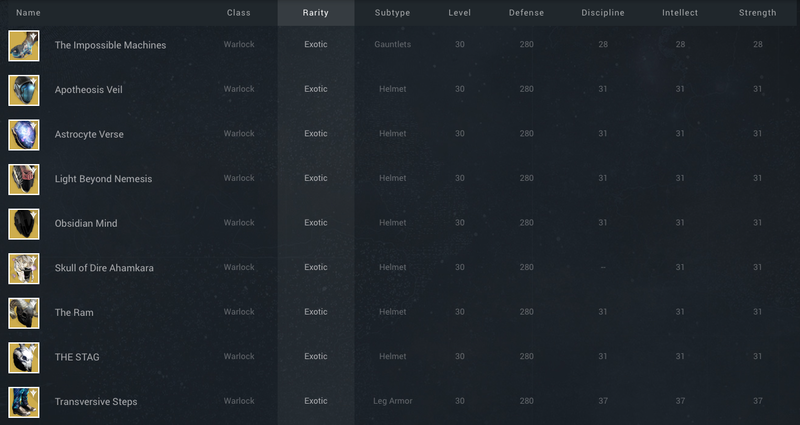 In total there will be 12 returning exotic pieces of armor for the warlock. 4 pieces of returning gear will be chest pieces. There will be 9 new exotic pieces of armor for the warlock, 3 of which are linked to faction quests and grant exotic class items. These exotic class items can be worn in addition to other pieces of exotic gear! And look at the amount of Discipline, Intellect, and Strength each piece of gear grants, much more than the Year 1 exotics! 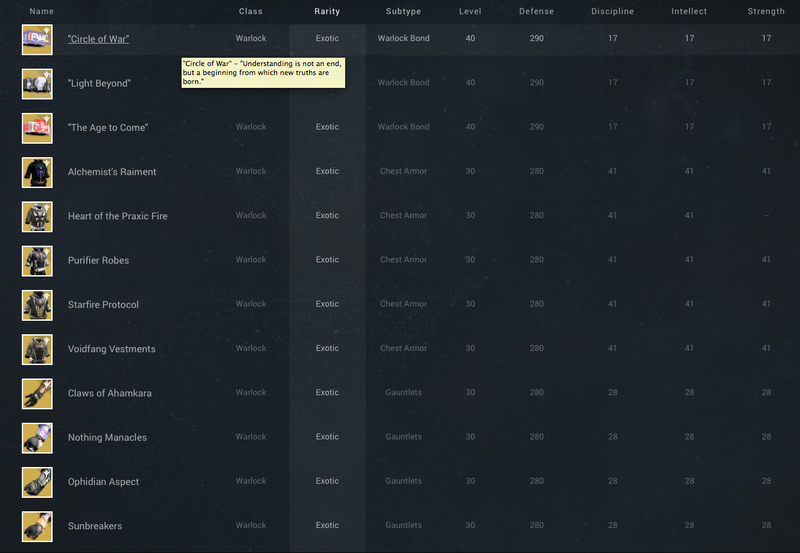 It is also safe to assume that the Taken King maximum defense level will be 280. Except for some of the weapons that are linked to special quests or raids. 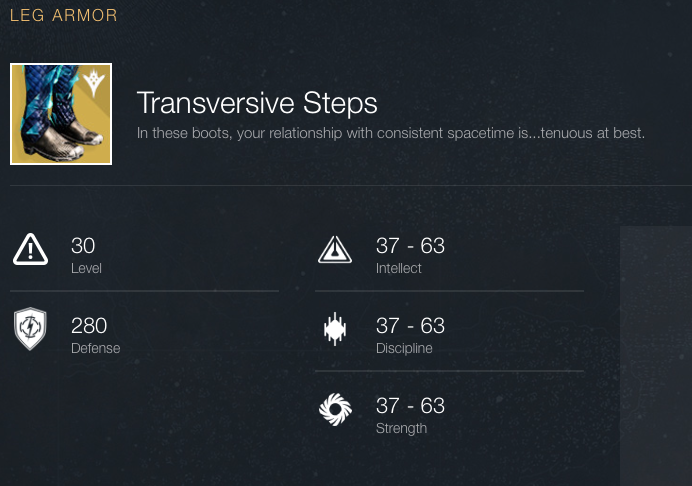 Now lets look at the Warlock’s first piece of exotic leg armor: Transversive Steps! Looking at the primary perks, Strangle Angles is the highlight. Moving faster while crouching could be useful in the crucible. Although with the current radar, crouching does not provide much of a benefit. However, picking up ammo automatically reloads the weapon matching that ammo’s type does benefit both PVE and PVP play. It can get pretty hectic during raids and picking up ammo without having to reload saves a lot of time, especially if you are trying to reload a rocket launcher. 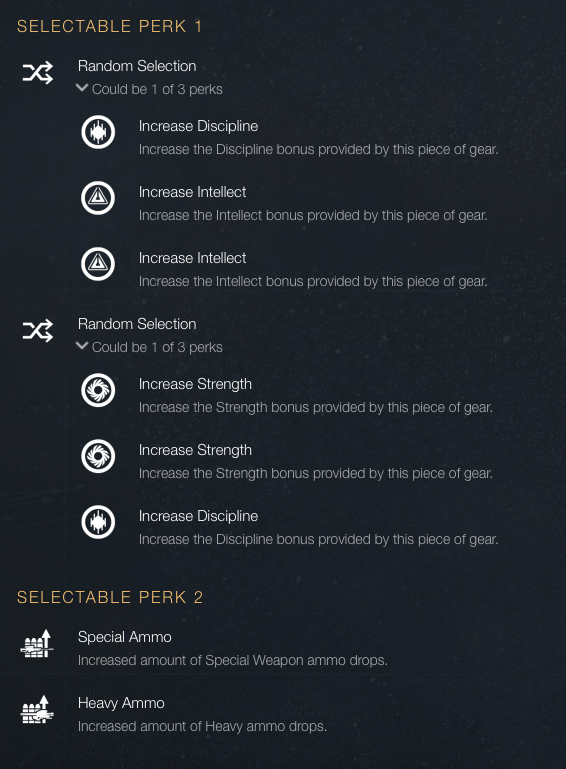 With exotic armor now having the chance to boost all three stats, Intellect, Discipline, and Strength, selectable perks have more of an impact. Rolling to increase some of these stats could mean the difference of life or death in the Crucible or a tough Raid boss. Each exotic piece of armor is now able to become reforged in order to change the stats and upgrades available on the piece of armor. This allows us to create a piece of armor that truly feels unique. Hopefully the gunsmith lowers his prices, because I spent most of my motes of light trying to reroll Party Crasher +1. Finally, Legendary and Exotic boots have been known for having a perk to increase the amount of Heavy Ammo you can carry, while these boots increase the amount of Heavy ammo drops. A very subtle but key difference to consider while choosing which piece of gear to wear. Will you choose to wear the Transversive Steps, or will the Warlock’s cloak just cover them up? Tomorrow will be looking at some of the Hunter’s new exotic gear! See you then! when do the Transversive Steps come out in destiny?